Each $129 box contains 24 packs. Each pack contains 5 cards. 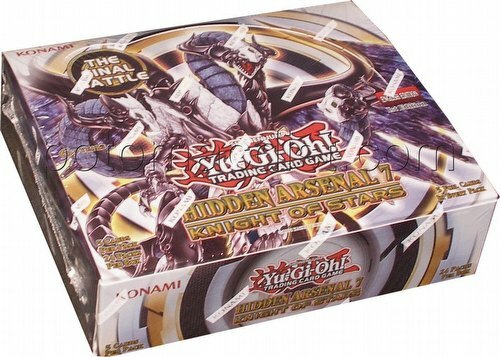 Hidden Arsenal 7: Knight of Stars sets the stage for Hidden Arsenal's climactic final between light and darkness. Each side is bringing mightiest monsters to the fore, as the star-spawned Constellars face off against the sinister Evilswarms who have infested and corrupted the most famous Hidden Arsenal monsters of the past 3 years. Gem-Knights, Gishki, Gusto, and Laval monsters are also bringing up their biggest creations yet, plus new Spell and Trap cards give them an edge against the Constellar and Evilswarm powerhouses. The set contains 10 new cards from the Yu-Gi-Oh Zexal anime series that are unavailable anywhere else. There are 70 cards in the set (24 Secret Rares found 1 per pack & 46 Super Rares found 4 per pack).